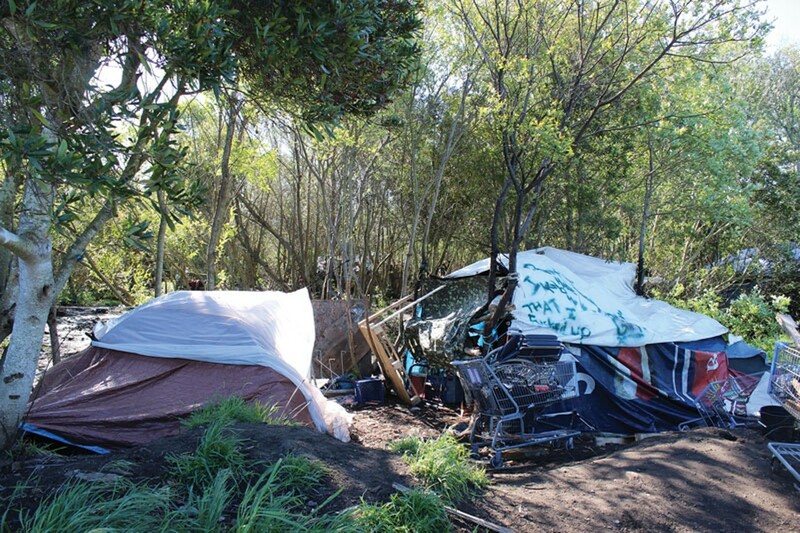 About 100 people were living in some three dozen encampments in the area behind the Bayshore Mall when Eureka police conducted a sweep on April 15, searching for people with active arrest warrants. Trish stood in front of her tent petting her medium-sized, black and brown dog as gusts of wind rustled the nearby brush and dozens of police officers scoured the area, rousing homeless people from their tents to check their identifications and search for outstanding warrants. 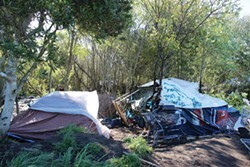 The multi-agency sweep of the encampments behind the Bayshore Mall on April 15 netted more than two dozen arrests, according to the Eureka Police Department, and came as a crackdown on what Chief Andrew Mills called "a criminal element that has infiltrated" the network of homeless camps that surround the railroad tracks near the Devil's Playground. While the officers made efforts to contact every one of the 100 or so people living behind the mall, Mills said folks like Trish, whose only crime was camping, were left alone. But he warned they will be forced to move from the area in several weeks, as soon as the city approves a designated camping area for them. "I can't kick people out until we have someplace for them to go," the chief said, adding that his plan is to have a camping area in place within a month, after which officers will evict everyone from the greenbelts surrounding the mall and conduct regular follow-up patrols to make sure the area remains vacated. Mills' announcement — that the city is on the cusp of creating an "organized, controlled and safe" area for the homeless to stay temporarily — was almost lost in the day, as headlines focused on the 27 arrests and the dozen or so firearms EPD has pulled from the area in recent months, which were spread across a folding table in the mall parking lot for an inviting photo op. But to Trish, a woman who appeared in her mid-20s and said she's been living in the greenbelt for about a year, the possibility of moving someplace where she won't have to worry about illegal camping tickets and can sleep a bit safer is enticing. "It's not like we like living down here — I hate it," said Trish, who declined to give her last name, saying she's ashamed of her situation. Mills said the sweep — which featured more than 50 officers from at least seven agencies — came as a response to an increase in unruly activity in the area and was part of a larger enforcement effort. Recent months have seen EPD serve a series of search warrants on encampments in the area, and the mall itself contracted with the city to provide daily foot patrols inside the mall from March 17 through April 17 (see Blogjammin, page 8, for more details). Trish and her neighbor, who identified herself only as Donna, said they agree that there's been an uptick in violence and unruly behavior in the Devil's Playground area, but Trish said the spike seems to have coincided with EPD's sweep of encampments at the foot of Del Norte Street some months back. She said that seemed to just move more people into the area behind the mall. EPD Capt. Steve Watson said history has made clear the city can't simply sweep and enforce its way out of the homeless problem, which is where the designated camping area comes in, though he and Mills made clear it's viewed as a temporary arrangement. Long term, Mills said, he's hopeful that the repurposing of the Multiple Assistance Center and the pursuit of some housing-first strategies will make a lasting difference. But, in the short term, he says people like Trish and Donna need somewhere to go. Eureka City Manager Gregg Sparks said the city is currently eyeing three properties (two owned by the city and one privately owned) for the potential camping area, though he declined to publicly identify the sites. There are a host of liability concerns associated with creating such a site, and Sparks made clear the city isn't referring to the proposal as creating a "sanctioned campground" and that, preferably, the city won't be overseeing the campground's operations. Instead, Sparks said the city is talking to a number of service providers and community organizations (he wouldn't specify which) about supervising the campground, with EPD conducting periodic patrols. Mills said he does not envision making the campground a strictly clean and sober environment, as that might keep folks from actually using it. Those camping in the designated area, Mills said, will have "a right to privacy in their tents" but officers patrolling the area will take enforcement action if they see any illegal activity out in the open. Sparks said Mills was slated to brief the city council on potential properties for the campground at its meeting on April 21, as the Journal went to press, but the topic was only agendized as a discussion item. Ultimately, Sparks said, the council will have to direct staff to move forward with the idea, so any formal action probably remains at least a couple of weeks out. The subject of a designated camping area has proven controversial in the past, especially once proposed locations are made public, so it's unclear how smoothly the process will move forward. But Mills said it's clear the current situation is untenable. 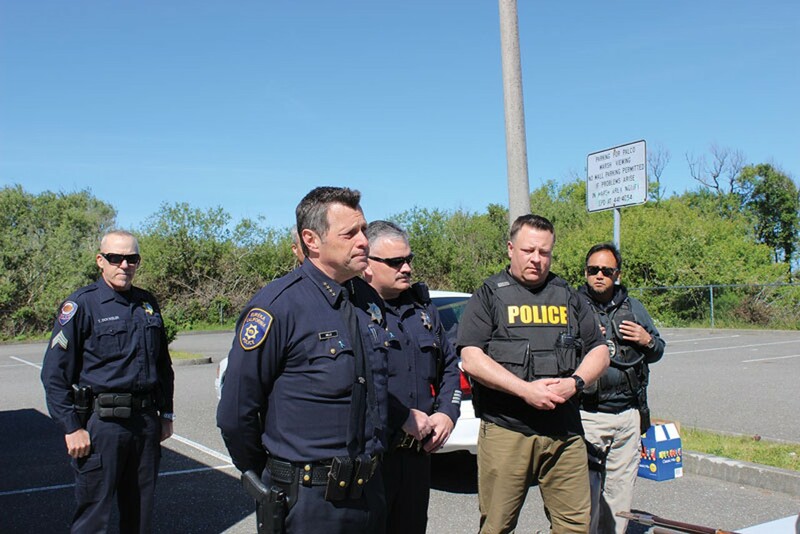 On April 15, as officers scoured the area behind the mall, the greenbelt was sprinkled with more than three dozen campsites that were home to some 100 people. 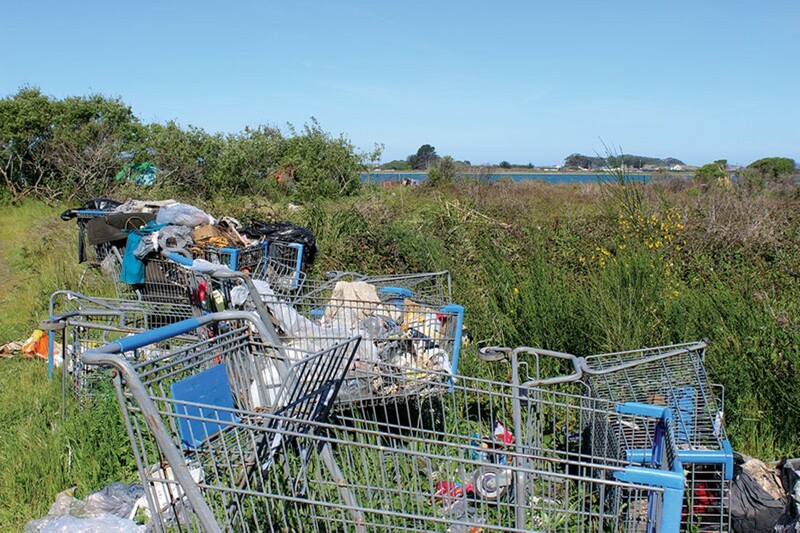 The camps were located in clusters, some of which appeared to be fairly clean and well kept, while others were strewn with shopping carts, litter, refuse and debris. 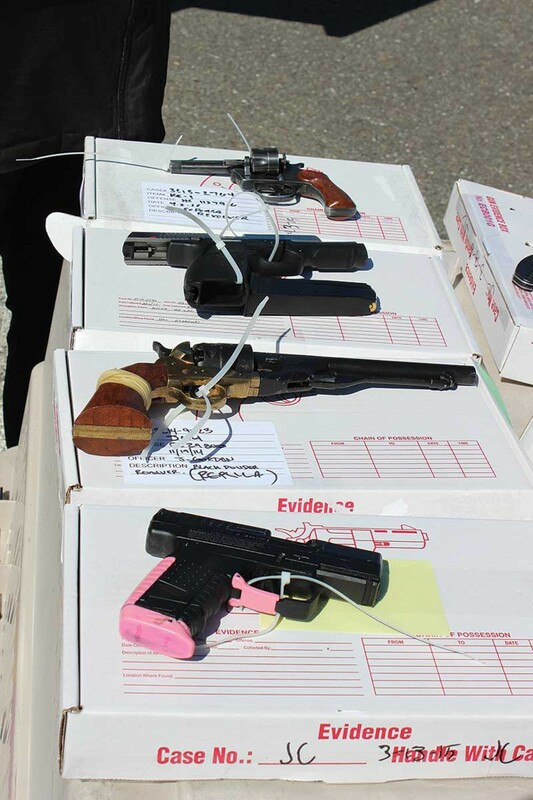 With a table full of guns in front of him, Mills noted during a press conference that Eureka can't arrest its way out of this situation. "In the long term, there has to be other solutions," he said. "We fully comprehend homelessness is not a police problem." The various impacts of homeless populations, however, have been left for local police to deal with. Whether Eureka can take steps in the coming weeks to create a designated camping area — and whether that will do anything to stem the tide of impacts — remains to be seen.